Dry Integral Color Get consistent color from batch to batch, cost effectively, with Solomon dry integral color. 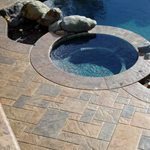 If you're planning for new concrete or you're rejuvenating an existing surface, you'll find custom concrete ideas throughout the pages of The Concrete Network. Nowhere else on the Web can you access such a vast library of data including original articles, reports, guides, catalogs, photos of designs, and ideas for applications. Plus, you can find a list of local concrete contractors in your area. Free Newsletters Sign up today!